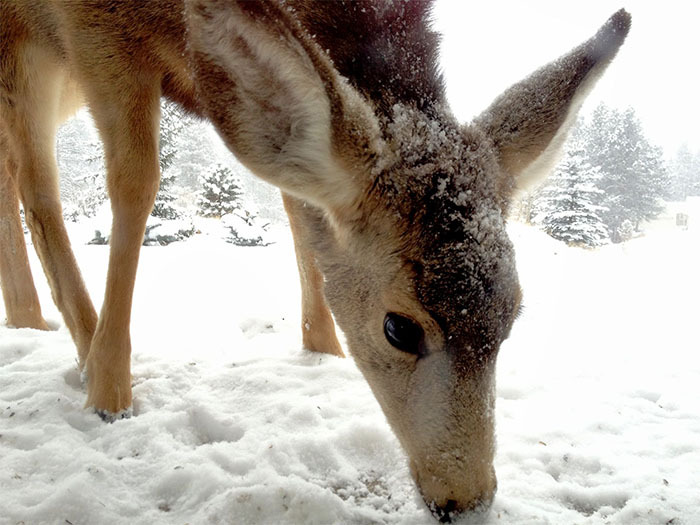 Yesterday’s first big winter storm of the season brought a lot of critters out of the forest to forage for food. I noticed a small cluster of mule deer rooting near the house close to one of our large sliding glass doors. Out of curiosity I decided to lay down near the window and wait patiently to see if the deer would perhaps wander up near the glass. I was mostly interested to see how they would react when they realized just beyond their nose was a creature of a different kind. One particular doe, with big charcoal eyes, was browsing very close. She certainly looked intent on finding any stray bird seed from our feeders or any other tantalizing tidbits. For a split second she realized something just wasn’t quite right. She yanked her head upward and her front legs stiffened. Then, just like with me, curiosity got the better part of her and she slowly edged her shiny black nose up near the glass pausing for a moment and then gracefully went back to browsing. I laid there for about ten minutes just taking in the magical scene.